Where are your kids AFTER SCHOOL? Transportation Martial Arts at Lewis Global Karate will transport your child from school to our martial arts studio every day that school is in session. The program offers daily Martial Arts instruction in Tang Soo Do, a traditional Korean Martial Art. 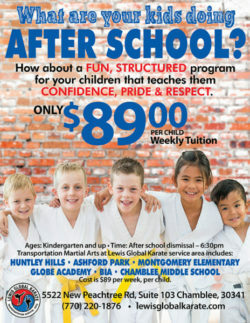 Typical Schedule: Arrive at LGK, snack time, Karate Class, homework time, parent pick up. Exact times depend on school dismissal time. This program operates during the DeKalb County School year. TMA does not operate during school holidays. Schedule will follow DeKalb County school closings – if schools are closed due to weather, then TMA program will also be closed. If you are a current member of LGK, enrollment in the After School Program replace your current membership – you won’t pay for TMA (weekly) and studio membership (monthly). This program is not licensed by the State of Georgia, nor is it required to be licensed by the State of Georgia.